There are no Fighter Pilots down in hell! The place is full of traitors, deserters, and evaders! The schedule had me leading a four-plane mission to North Vietnam. My orders to detach from the VMF (AW) 235, Death Angels, were effective in three days. This would probably be my last flight north of the DMZ. I thought of the many pilots reportedly shot down on their last mission. Of course it was their last mission! I could see the pilot descending in his parachute using his emergency radio, "Hello Hillsboro! Tell my Ops Officer not to schedule me for tomorrow. This was my last flight!" The target was heavy gun emplacements northeast of Dong Hoi. My wingmen were Jim Herlocker, Jim Lucas, and Jim (Fly) Cunningham. They were absolutely fearless. Gearlocker was a cocky, boastfully capable pilot who could back his words with deeds. Luke was a can do-will do, always ready fighter pilot who exuded confidence. Fly was a seasoned crusader pilot, a centurion on the Forrestal with many arrested landings on the Sara, Shang, and other carriers. I thought of Orson (Lobo) Swindle, a courageous Death Angel pilot who had been shot down in the target area eight months before and captured by the NVA. On his last mission, right?" I didn’t want any of my flight shot down. The TOT was for 10 AM. We met at Intelligence and got the current AAA and SAM info. The weather was CAVU. Our ordnance was eight 2,000 lb. GP bombs, 32 Zuni rockets, and 1600, 20 mm high explosive incendiary/armor piercing rounds. We could wipe out downtown Hanoi with that combined load. Many combat hits and aircraft losses were linked to multiple runs or to being the last couple of wingmen in the flight. For that reason, I decided to conduct a four-plane, parade, one run strike on the fragged target. The plan was to fly finger-four parade during the roll in and delivery. All pilots would pickle ordnance on my command. We would save the lower guns for RESCAP. 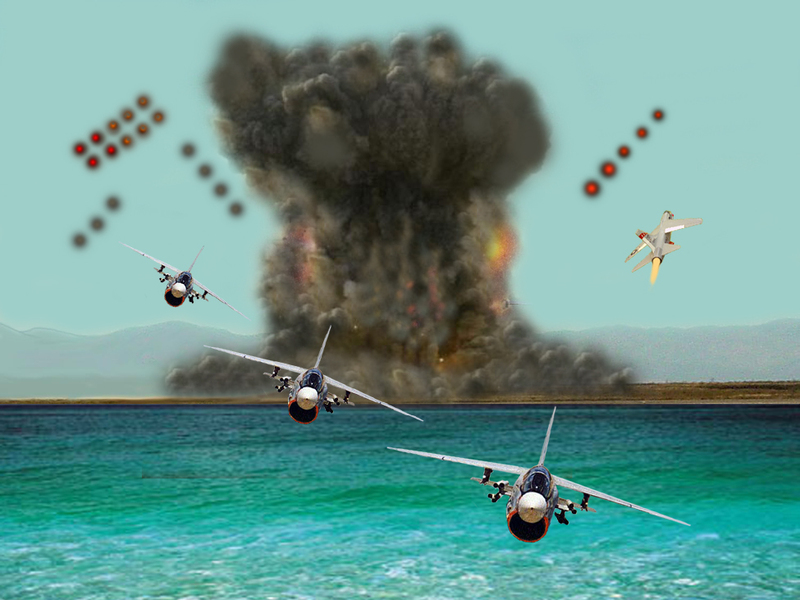 Following the drop, the wingmen would move out to a spread formation, engage burner, and fly east at Vmax to the Tonkin Gulf. We manned our aircraft one hour before scheduled takeoff. The maintenance and ordnance crews were outstanding; with unsung heroes like lves, Decker, Addaway, Bradshaw, and Caulkins. The Crusaders launched to the south from Da Nang Air Base at ten-second intervals. The climbing rendezvous was accomplished while turning north. The flight leveled off at 15,000 ft. We were twenty minutes ahead of schedule so we made two practice runs near the Repose which was anchored serenely off Dong Ha, South Vietnam. Satisfied with the maneuver, we continued north. Abeam of Dong Hoi, the flight contacted the AO coordinating combat flights in Route Package One. We were cleared to the target. The visibility was forever. We could see Vinh and even much farther north, Haiphong. The formation turned west when northeast of Dong Hoi at 15,000 ft and 400 knots. We crossed the beach and continued west until visibly identifying and passing north of the target. We then turned south toward our roll-in point. When the target was abeam of my left wing tip, I started a descending roll onto the target line. In my mirrors, I saw Gearlocker's upper guns flashing fire as he hosed down the countryside. He was ahead of the plan, but what the hell, we had no friends down below. As I rolled out on target heading in a 70-degree dive, I called, "Guns, now!" We sprayed the target area with our upper guns from 12,000 ft down to 8000 ft where I called, "Zunis now!" The 32 Zunis blazed brightly as they "whooshed" toward the enemy guns. The rockets blasted the target and surrounding area within 300 meters. The AO reported, "Great target coverage!" At 7000 ft, I called, "Bombs away!" We jettisoned the eight 2,000 LB bombs and commenced a 7 G pull out. As the nose passed through the horizon, I called, "Burner now!" The formation bottomed out about 2,000 ft. We raced toward feet wet. The wingmen split away as briefed. I jinked left to see the BDA. The AO was screaming, "Beautiful! Beautiful! You got em! Targets destroyed! Great job!" I watched the red-brown dirt, black smoke, and fiery debris rising and boiling in a column at least 5000 ft above the target. The top of the column became mushroom shaped as the debris commenced raining down. Bursts of flak were blossoming between the target and Dong Hoi. The multi-altitude flak was not even close. I had seen enough. I broke back to the east. Five miles offshore, I made a climbing right turn while the flight joined up. We made two orbits offshore to view the huge black cloud that marked the great destruction we had caused. We radioed Devastate Delta at the DMZ and continued to Home Plate. 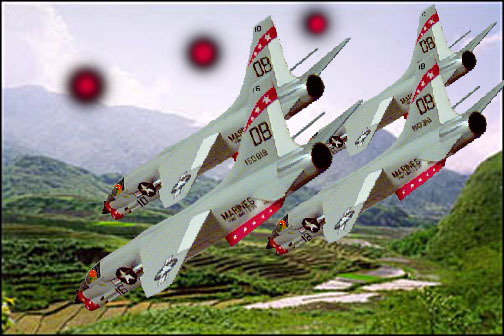 I thought of all the brave Navy and Air Force pilots and crews who flew into the hell of Hanoi and Haiphong on a daily basis and wished all would return home safely. I also wished all my combat missions had been as easy as my last flight north.